Comics fans across the pond have plenty to frown about. Since May of last year, DC Comics has been building to an enormous event that intersects the worlds of the iconic Watchmen with the traditional DC Comics universe. It may not sound like much to the casual reader but the merging of these two worlds is something that comic geeks have debated about for decades. As with all great stories, comic readers and collectors are just as excited about the accompanying cover art for the issues that will span the course of this arc. However, that art will not be available to fans in Europe. Why? The short answer is because the special covers that DC is releasing feature the unmistakable blood splattered smiley face that is the hallmark of the Watchmen and in Europe, that’s a “no-no”. Now comes the part of the story that impacts our dear European comic fans. In order to feature a smiley face on the cover of any publication, including comic art, you’ve got to pay the piper. 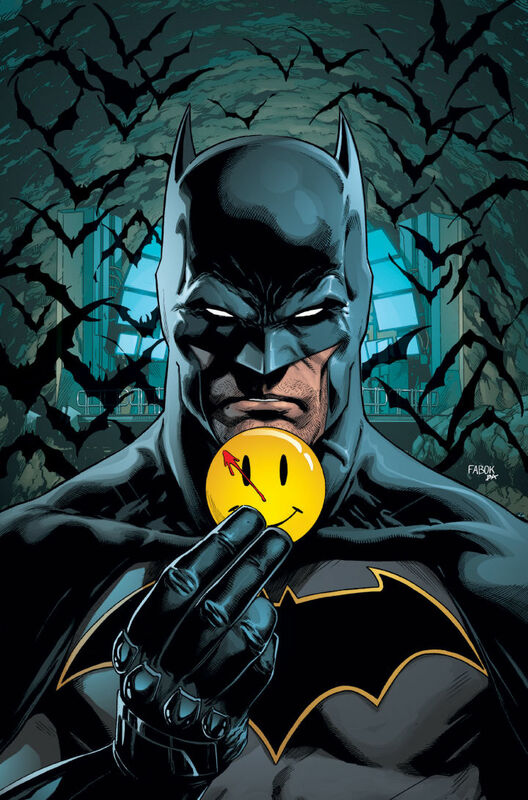 DC Comics was not willing to incur that expense in the European market, instead, opting to scrap the blood splattered smiley face from the cover of its graphic novel, Watchmen which had become synonymous with the wildly successful book. The differences between the cover art in the States and Europe were unmistakable, making the original graphic novel cover a much sought after collectors item in the U.K..
All of this serves as a stark reminder that even in the world of fantasy and escapism that epitomizes comics, business is business…and Superheroes are big business. It’s the fans, however, who are caught in the crossfire while trademarks are litigated, dollars are counted and smiles are turned upside down.